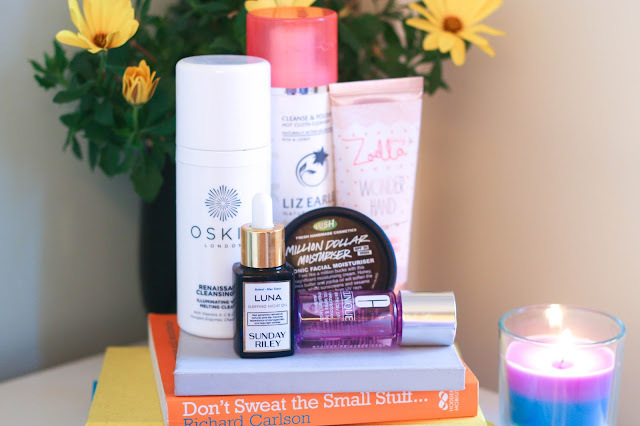 As soon as I finished filming my May Favourites Video, I realised I had accidentally missed some of my current favourite skincare bits, so I thought I'd tell you about them here. Liz Earle Cleanse and Polish - I'm sure you've all heard of this one by now. It's a cream face cleanser which comes with a muslin cloth (both are also available separately). I love using this because it makes my face feel so clean. 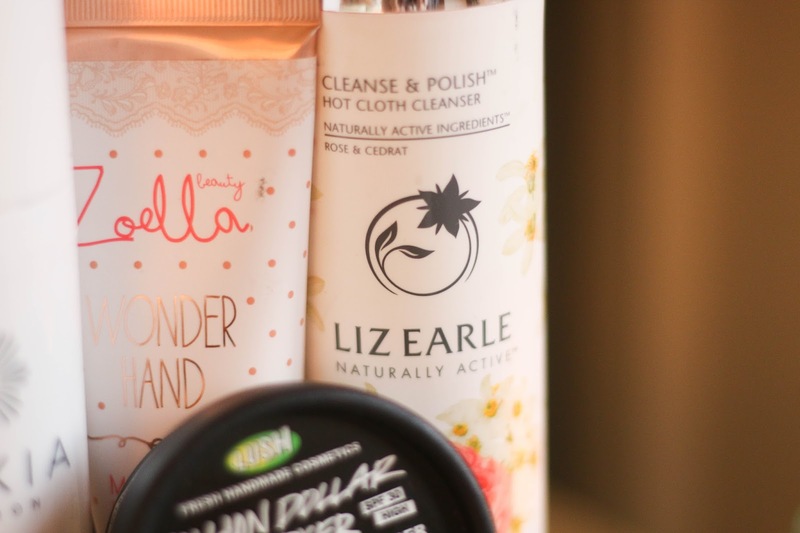 Although it is not great at removing all traces of makeup, eye makeup remover is often required alongside this one, but that's hardly a problem when it leaves your skin feeling so fresh. The one I have at the moment is a Spring limited edition Rose and Cedrat scent. I love this scent, it's not too overpowering and perfumed, and still has some lovely floral tones to it. I wish the scent wasn't limited edition, but having said that I had no problem with the original scent before I tried this one. 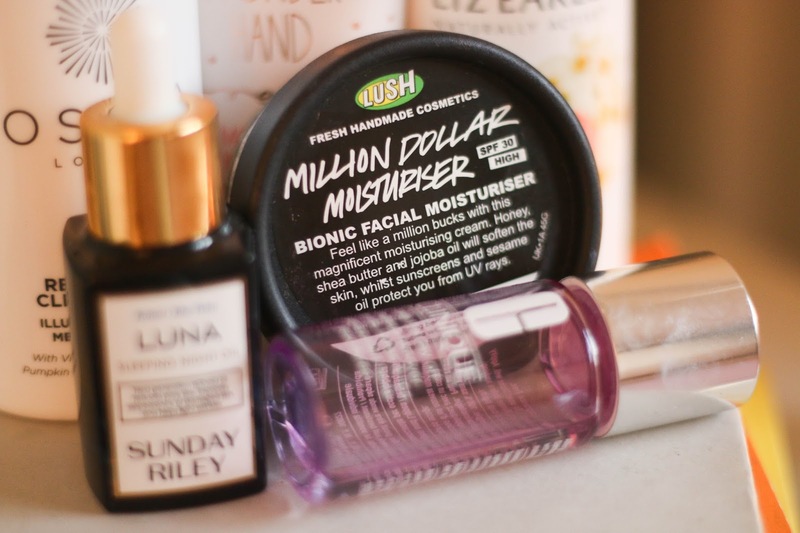 Lush Million Dollar Moisturiser - This moisturiser is a real skin game changer. It has some subtle shimmer running through it, which give your skin a natural dewy glow, and leaves you with a slight highlight all over the face. It is amazing. It's quite a thick constancy and a little goes a long way so the pot should last me a while. 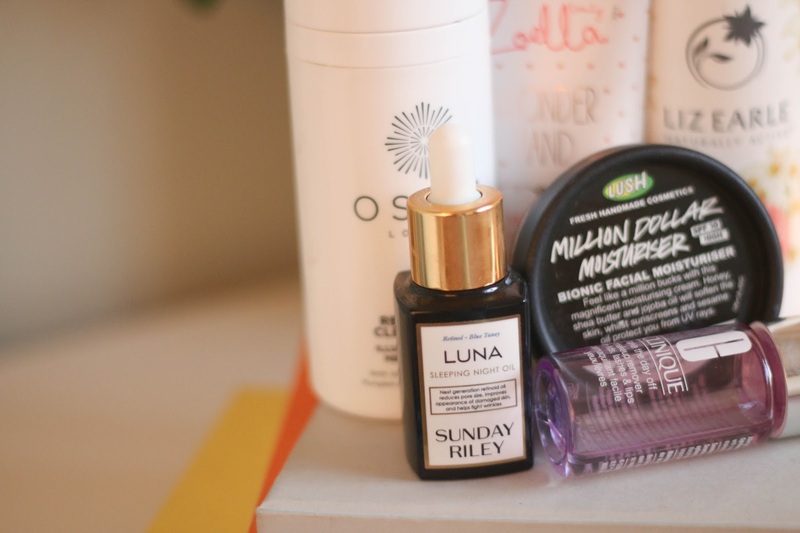 The tiniest bit gives your complexion a healthy finish and leaves your skin feeling hydrated. 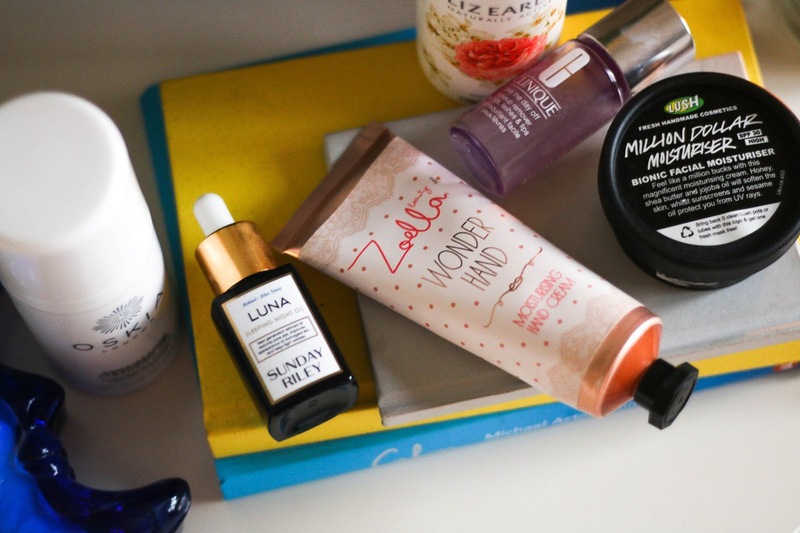 I suffer from quite dry sensitive skin, and since I've been using I don't seem to have any dry patch as all. Makeup also applies really nicely over this moisturiser. The thick consistency helps to even out the skin and the glow and texture set a perfect base for foundation. The product has a very natural non-perfumed scent which personally I love in a moisturiser. 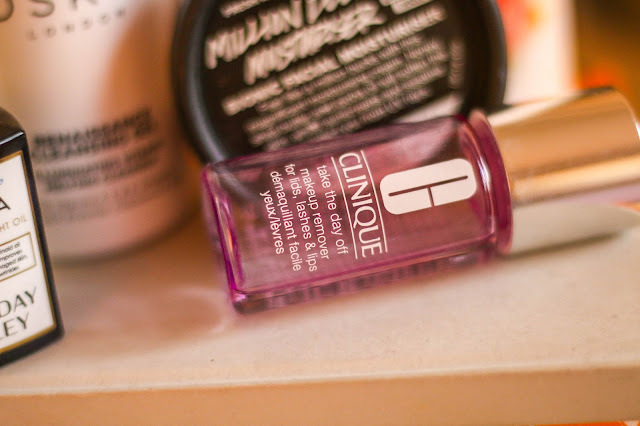 Clinique Take the Day Off Make Up Remover - I don't quite use this to take the day off, but I use it to take off any last traces of makeup once I have used my cleanser, and it does the job while leaving your skin to feel hydrated and smooth. It also doesn't irritate my sensitive skin. At the moment I'm coming to the end of my travel size bottle but once it's up I'll be picking up a full size. Zoella Wonder Hand Moisturising Hand Cream - I think I've mentioned this before, but the Zoella hand cream has pleasantly surprised me. It leaves my often dry hands feeling soft and smooth, and smelling lovely. I have found myself reaching for this over my higher end hand creams. Recently it' has saved my hands from a horrible dry, sore, cracked state they were in! It's becoming a product which I need to stock up on so I can have one at home, one at work, and one in each of my handbags! 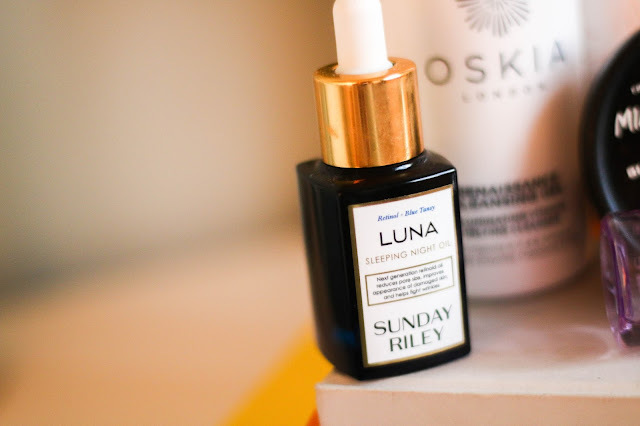 Sunday Riley Luna Sleeping Oil - This is definitely on the pricey end of skincare, however, this came in my Cult Beauty Box by Anna and Lily, so the massive discount meant I could justify having such an expensive skincare product. It cost a lot but I think this may be worth the price! As unhelpful as this might be, it's hard to describe what it does to your skin (sorry!) but it makes a huge difference. Even after one use, my skin felt brand new in the morning. It's an un-perfumed scent, but gives off a strong but pleasant natural smell, and leaves a slight blue tint on your skin (weird, I know) but it doesn't stain your bedding or skin for the matter, just leaves everything feeling lovely when you wake. 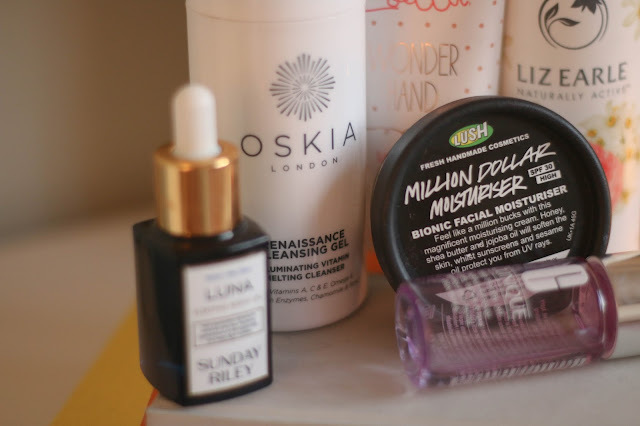 Oskia Renaissance Cleaning Gel - I've been rotating between this cleanser and the Liz Earle recently (or using both). I love this for when I'm wearing a little more makeup as the gel formulation breaks down makeup so simply, it doesn't require any scrubbing or irritate the skin at all, it smells great and makes washing your face so much more pleasant, no make what you've had on your face that day. 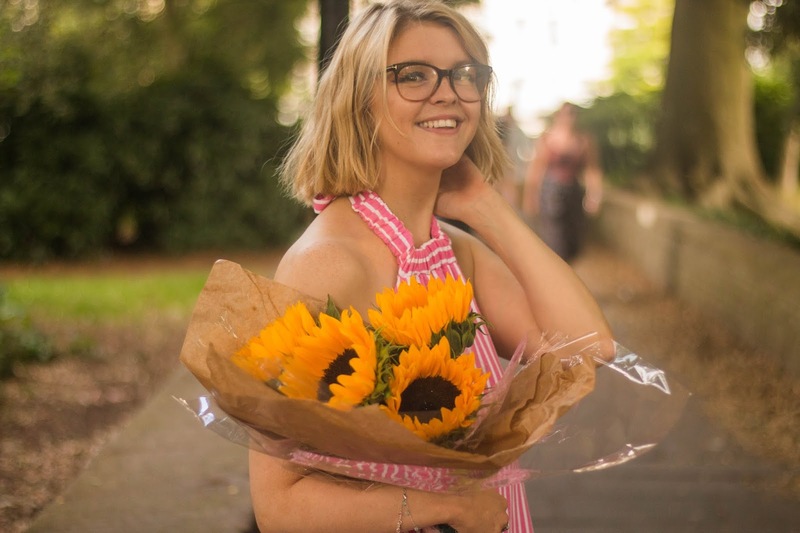 Explore with me | Centre Parcs part 2. Explore with me | Centre Parcs part 1. 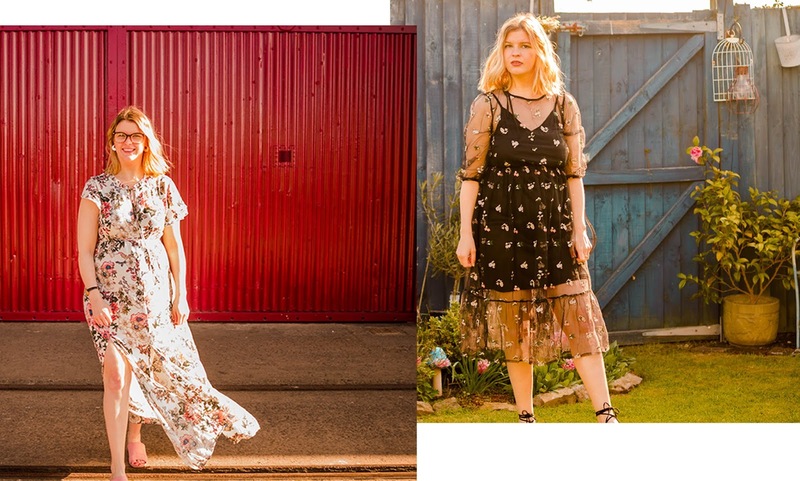 May Fashion and Beauty Favourites 2016.